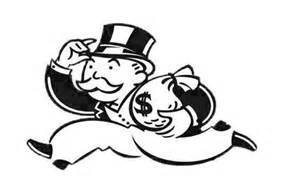 On The Road To Plutocracy: How many billionaires does it take to change a light bulb? How many billionaires does it take to change a light bulb? None. Billionaires don’t change light bulbs. What a stupid question. UP@NIGHT apologizes. Here’s a much better question. How many billionaires does it take to match the wealth of half of the planet’s population? Answer: 80. The number has been dropping rapidly in the past few years, from 388 in 2010 to only 80 in 2014. 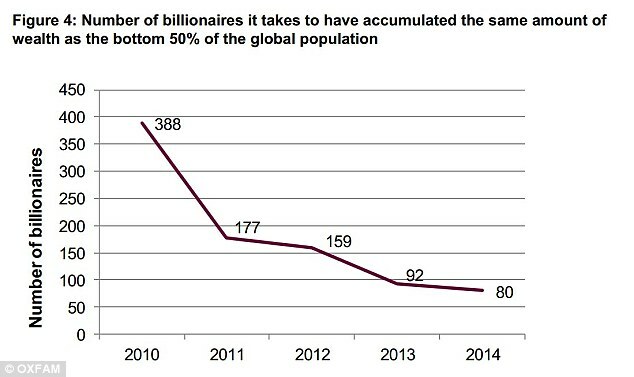 The concentration of wealth marches on. 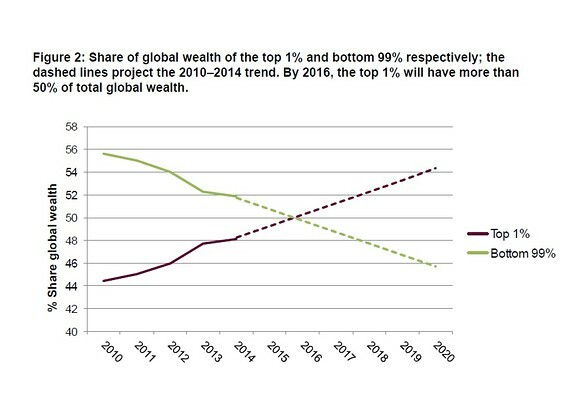 This chart is from Oxfam’s report, “Wealth: Having It All and Wanting More.” According to the same report, 1% of the world’s population in 2016 will have more wealth than remaining 99% of the earth’s inhabitants. This situation in the late 1920’s set up for the Great Depression and birthed a vital labor movement in the US. When will we in the economic majority have enough of this?